Austin Meade is a young cat that we’ve been excited about for a quite a while. A millennial with a 70’s soul, Meade’s songwriting skills are beyond his years. His guitar prowess adds some vintage rock ‘n’ roll edge that contrasts his smooth melodies that are easy on the ears. We’ve featured Meade on 20 Questions and he’s played River Jam several years running, including last year’s Saturday night full band performance at the River Road Ice House. Austin Meade’s latest album, “Waves” hits the streets on March 1st. As the title suggests, Meade looks at life through a surfer’s eyes, riding the crests while enduring the troughs. Sometimes you reminisce on the epic rides with exuberance; sometimes you lick your wounds and learn from the wipe outs. We’re fortunate to give you a sneak peek by premiering the track “Growing Pains” here at Galleywinter. Meade’s upbeat but mellow delivery is backed by a groovy drumbeat that gets your head nodding from the get-go. It’s an open the sunroof type of tune that will turn your spirits after a challenging day. 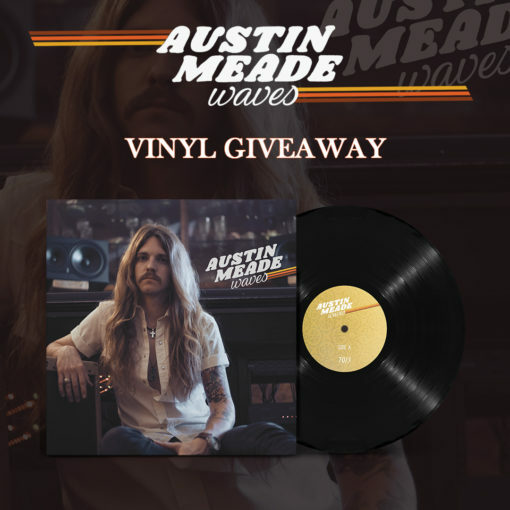 We dig it so much that we’re giving away an Austin Meade autographed vinyl of “Waves.” Leave a comment below and we’ll pick a winner. Great song! Gonna be a hit!! I like Austin’s Satan & St Paul better than Fullbright’s original. Great job. Gonna have to dive deeper into his stuff! Really like this. Cant wait for the full album. I will literally buy a record player if I win this! Sounds like Fergie and Jesus….but in a rock band. Can’t wait for this album. Saw Austin at an early set at Medicine Stone last year for the first time and loved it. John Fulbright was in the audience and he brought him up to do Satan and St. Paul with him. It was very cool. Miss having him play at local beer joint. Great music, good grooves, and the one artist missing from my vinyl collection…. I first found Austin’s music at medicine stone 2018 and was blown away by him! Looking forward to his new album! Been following Austin and the guys for a while. Love their vibe and music!! One of my favorite young artists. He’s gonna be big. Would love this. We like giving away cool schwag and sharing the gift of music.